Today in Masonic History George Washington is born in 1732. George Washington was an American politician and soldier. Washington was born on Pope's Creek Estate which is near present day Colonial Beach, Virginia. Washington's father passed away when Washington was eleven. Washington's older brother, Lawrence, became a surrogate and role model for Washington. Due to the death of Washington's father, Washington was unable to travel to England for a more formal education. Instead Washington was taught by tutors and attended a school run by Anglican clergy. At the age of 15, Washington sought an appointment to the Royal Navy. His widowed mother refused to allow him to go. By the age of 17, Lawrence, using his influence in Virginia society, had secured Washington a well paying position as a surveyor. This allowed Washington to begin investing in land, which he would acquire large amount of over his life. In 1751, Washington traveled with Lawrence to Barbados. Lawrence was suffering at the time from tuberculosis and it was hoped that the trip would improve his health. The trip had no effect on Lawrence and died the following year. Lawrence's passing brought changes to Washington's life. Washington would inherit Mount Vernon from his brother's estate. At the time of his passing, Lawrence was the Adjutant General of the Virginia Militia. The Governor of Virginia split the militia into 4 parts giving Washington on of the posts of district adjutant along with the rank of Major. In 1755, before the beginning of the French-Indian Wars (part of the 7 years war), Washington was sent by the Governor of Virgina to request that the French withdraw from the Ohio River Valley, a request the French refused. On his trip Washington met the Indian leader Tanacharison, the two men became long time friends. On his journey Washington also kept a journal of the events, on his return to Virginia the Governor insisted that the journal be published, this gave Washington a great deal of notoriety. Through out the war, Washington would be a military leader and would receive commands of his own. He would seek a commission in the British Army and would never receive it. He took the opportunity to study British tactics and learned military, political and leadership skills that would serve him well in his life. In 1775, when the American Revolution began, Washington appeared at the 2nd Continental Congress in full uniform, indicating that he was ready for war. Although he tried to convince the delegates that he might not be the best selection for the head of the newly formed Continental Army, he was voted into the position of General and Commander-in-chief. Washington would lead the Continental Army through good times and bad. Through shortages of gunpowder and other critical supplies. Finally in 1781, the surrender at Yorktown all but ended the American Revolution and Washington's troops were victorious. In 1783, with the signing of the Treaty of Paris, Washington resigned his commission and returned to Mount Vernon. In 1787, Washington was convinced to go to the Constitutional Convention in Philadelphia. When he arrived he was elected President of the Convention. As President he stayed out of the debates and would vote little, except on specific articles. Washington kept the delegates on task during the convention. When the convention was done, it was Washington's support of the Constitution is what convinced many to sign it. In 1789 and 1792, Washington was elected by the electoral college to be the first President of the United States. To this day his two elections to office are the only times that a president has received 100% of the votes from the electoral college. Washington made sure that his Presidency in no way resembled the Royal courts of Europe. When Congress voted to pay Washington $25,000 a year, a large sum in those times, he initially refused. Congress convinced him that he would be creating a precedent that future Presidents would have to be independently wealthy. Washington also insisted on being called "Mr. President" instead of some of the more majestic titles that Congress had come up with. Washington insisted on serving only two terms, again trying to set a precedent for future presidents. Washington passed away on December 14th, 1799. 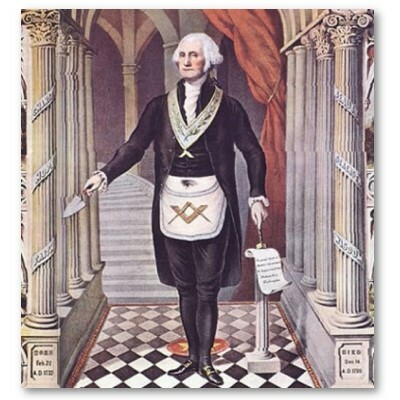 Washington was initiated into Alexandria Lodge No. 22 in Fredericksburg, Virgina in 1753.